Born on September 23rd, 1926 in Hamlet, North Carolina, John Coltrane’s life started with music all around him. His father played several instruments which triggered John’s interest in jazz and more specifically, the clarinet and E-flat horn. Besides his father, Coltrane had other musicians in mind that influenced his style, like Johnny Saxophone and Miles Davis to name a few. Later, he began his musical education in Philadelphia at Granoff Studios and the Ornstein School of Music. For a brief time, Coltrane was called for Military service in WWII where he played with the U.S. Navy Band in Hawaii. After being discharged from his duties, Coltrane began playing the tenor saxophone with the Eddie Vinson Band. He has described the 40’s as a time when his listening opened up to a different area when musicians like Coleman Hawkins, Ben Webster and Tab Smith were doing this he didn’t understand but felt emotionally. In 1955, Miles Davis called Coltrane after his bout with heroin because he was about to start a quintet. With Red Garland on Piano, Paul Chambers on bass, and Philly Joe Jones on drums, the 5 of them went on to record several albums like Cookin’, Relaxin’, Workin’ and Steamin’. The 5 eventually disbanded in 1957 due to Coltrane’s herorin addiction. In 1958, Davis and Coltrane rejoined each other in Davis’ group. During this time, Coltrane had perfected his style playing hundreds of notes per minute. Coltrane stayed with Davis until April, 1960. During this time he participated sessions with Davis such as Milestones and Kind of Blue, and concert recordings Miles & Monk at Newport and Jazz at the Plaza. Released in 1958 on Blue Note Records, Blue Train was recorded at Van Gelder Studio in Hackensack, New Jersey. This was Coltrane’s second solo album and the only one he recorded for Blue Note as a leader. 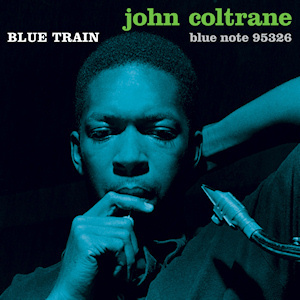 Blue Train is considered the best album of his period because 4 out of 5 tracks are original compositions of Coltrane. Two tracks, “Moments Notice” and “Lazy Bird” use Coltrane’s technique of chord substitution cycles or more commonly referred to as Coltrane Changes. Coltrane changes are harmonic progression variations using substitute chords over common jazz chord progressions. A beautiful album, full of jazzy harmonics and original Coltrane compositions is rightfully in our BURL vinyl collection, and it should be in yours, too!